PTFE Coated Glass Cloth heat sealing tape combines the properties of PTFE with the mechanical strength of glass cloth. It has a good heat and chemical resistance along with excellent non-stick properties. PTFE coated glass cloth is available in plain or self-adhesive backed and as anti-static if required. PTFE coated glass cloth is extremely popular for heat sealing applications. We can convert PTFE coated glass cloth into gaskets and strips cut to any width to suit your requirement. High quality glass fabrics combined with specially formulated high level of PTFE content to produce super smooth, high-gloss surface coating. It has also good abrasion resistance and tensile strength. 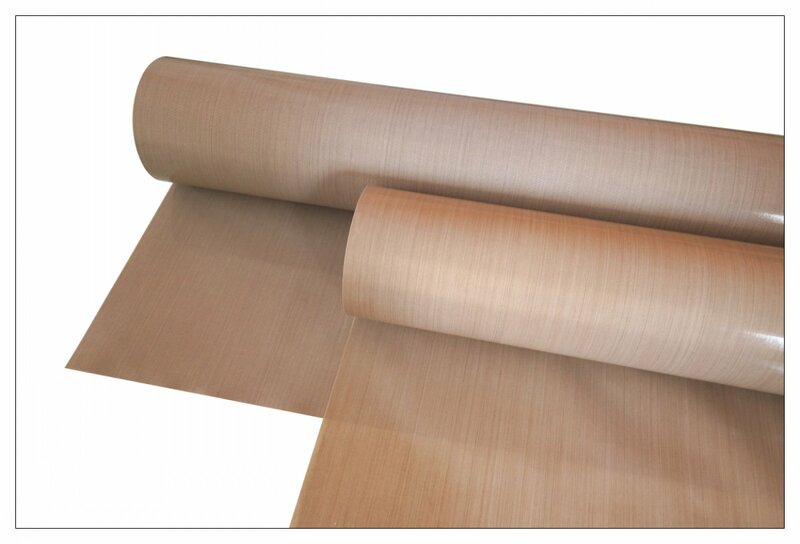 Applications may include laminate-release sheets, belting for food, electrical insulation and industrial processing. These products can be used in direct contact with food. These products provide a superior non-stick surface to achive performance in a wide variety of applications with a lower cost alternative to PREMIUM GRADE. These products can be used in direct contact with food. This line combines quality glass fabrics with medium level of PTFE coating to achieve cost effective performance for mechanical applications such as heat-sealing, release sheets, belting. These products can be used in direct contact with food.